Stephen Girard: America’s Colonial Olympian, 1750-1831 by James J. Raciti, PhD. Sunstone Press, 2015; 272 pages, $24.95.Available from Amazon.com . Why is Stephen Girard, a figure from late Colonial America, important today? As a teenager, he left home in Bordeaux, France with meager funds and went to sea as a merchant marine, following his family's tradition. In early summer, 1776, he landed in Philadelphia when a British blockade forced his ship into the city's Delaware River port. With his extraordinary intelligence and with an ability to foresee market trends and grasp the mysteries of international trade, he remained in Philadelphia and became an American citizen. By the early eighteen hundreds he had become the richest man in America. Is this reason enough to pay closer attention to Girard? Why don't American History textbooks mention him? As the first private banker in America, he should be counted among our Founding Fathers. He labored tirelessly and unselfishly during Philadelphia's 1793 yellow fever epidemic, risking his life caring for the sick, sometimes performing the most repulsive tasks. Most wealthy Philadelphians had left the city. In 1811, Great Britain increased its harassment of American ships. Girard put his entire fortune into the hands of the US Treasury to wage war once again with a country that refused to accept America as a sovereign nation. He proved himself a courageous philanthropist and a great patriot. The War of 1812, an American success, forever freed the country from subservience to England. When Girard died in 1831, thousands of Philadelphians showed their love and respect for him. He left most of his fortune to the City of Philadelphia and to founding an institution for poor orphans--Girard College, opening its doors to students in 1848. President Truman visited the college for its centennial in 1948 to honor this remarkable man--a man who walked the streets with Washington, Jefferson and Adams and had flags made by Betsy Ross. 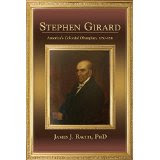 I have recently read Stephen Girard: America's Colonial Olympian . I am not an alumnus of Girard College and can't claim to know what it's like to have been a poor, fatherless boy. My comments therefore, are from a person who had no previously knowledge of Stephen Girard. I have asked several of my friends if they knew of this man. None had. This book is written for many levels of readers. Younger readers may benefit from the Question & Answer format which provides information on Stephen Girard's life. More seasoned readers may enjoy the references to Stephen Girard's influences by European philosophers such as Voltaire and Rousseau. It is so hard for me to believe that this French-born merchant mariner was able to live during our American War of Independence and for many years thereafter, showing a complete dedication to his adopted country, a generosity and courage in the face of adversity and a patriotism that knew no bounds can remain unknown to the average American. Shame on us! New biography gives unique look into benefactor’s life. This book is a must read for all those who have admired the lives and accomplishments of our nation’s Founding Fathers. It provides invaluable insight into the activities and motivations of Stephen Girard, the first major philanthropist in the United States, one who has been mostly ignored by historians who focus on the early decades of the Republic. James J. Raciti, a 1951graduate of Girard College, the boarding school established by Girard in Philadelphia, Pennsylvania, has produced a fascinating and informative biography. In deference to younger persons, who may wish to read this book, the author has introduced a fascinating Socratic dialogue for 75% of the text. This format is similar to the dialogues between the ancient Greek philosopher Socrates and his students. Each of 18 chapters consists of a series of specific questions and answers relevant to the life and times of Stephen Girard. They reveal new and fascinating details of all stages of Girard’s life including his unhappy childhood in Southern France; his financial successes as a mariner, merchant, banker, and eventually a farmer; his community services during the Yellow Fever epidemic; his financing of the federal government during War of 1812; and his death in Philadelphia at age 81. The dialogues are most engaging, for they reveal the multidimensional personality of Girard and his motivations as he dealt with his family members, employees, business colleagues, and local and federal government officials in his adoptive country as well as in France, including a jovial repartee with Joseph Bonaparte. Perhaps most salient for all those interested in past and contemporary educational practices are the descriptions of Girard’s emerging views over a three decade period that led to the specification of the educational philosophy, the effective management strategies of a boarding school environment, the comprehensive academic curriculum, and even the design of the physical plant of the school enabled by his generous entitlements. By examining source materials in both the extensive archives at Girard College and in southern France, Raciti is able to provide backgrounds that have not been included in the many earlier biographies of Stephen Girard. For example, he discusses in several chapters the relationship between Stephen and his siblings. Many family members attempted to convince him that he should share his accumulating wealth with relatives. Girard steadfastly refused, feeling that each person should strive, as did he, to become self-sufficient and support their immediate family members. However, when the children of several siblings were left destitute, Girard provided funds for their support, including their education in France and Philadelphia. Furthermore, Girard took into his residence the children of colleagues and employees and provided them a supportive home as well as an appropriate education. Raciti reports that Girard enjoyed having young people in his home environment. In other sections of this biography Raciti reveals Girard’s philanthropic spirit in voluntarily managing the hospital for victims during the Yellow Fever in 1793, negotiating the major loan that financed the War of 182, and over a 25 year period providing care and a comfortable apartment in the Pennsylvania Hospital for his mentally ill wife, Mary. Raciti reports that Girard privately shed tears at Mary’s funeral. Perhaps the most engaging section of this book is Appendix 1, entitled Stephen’s Twilight Visitors: A Fictional Dramatization of Stephen Girard’s Last Evening. In a radical departure from the standard format for an academic biography, Raciti provides readers the option of believing that Girard’s high fever created hallucinatory conversations on his deathbed with the spirits of several of his contemporaries, including his parents, his siblings, his wife, Mary, and such luminaries as Benjamin Franklin, Thomas Jefferson, and George Washington. Finally, all these hypothetical and biographical materials are preceded in this book by a letter from Raciti to Stephan Girard in which he writes about his experiences as a student at Girard College from elementary through high school graduation. He briefly describes the staff, the curriculum and the physical plant. Throughout the letter Raciti repeats his gratitude to Stephen Girard for his donation of the bulk of his substantial financial resources to creating the educational opportunities that have now benefited thousands of students over more than 150 years. Raciti, having graduated from Girard College one year after the author in the class of 1952. Cline holds a BS from Pennsylvania State University, an MS from Stockholm University, and a PhD from Harvard University. He is currently an adjunct professor of sociology and education at Teachers College, Columbia University. A friend who knows that I am an American History enthusiast recommended this title to me. I must admit that even though I majored in the field in college and was particularly intrigued by the personalities that were instrumental in the formation of the nation's government, Stephen Girard's name escaped me. What he is, as the author makes abundantly clear is a largely overlooked, but highly significant figure in our post-colonial period. So for that reason alone, this is an important contribution to our understanding of a Frenchman who became an American and who from his adopted home in Philadelphia, gave his talents and financial resources to forging our country's future. This is not a typical biography either in format or content. It is apparent that the author aims broadly in his biographical coverage and wants readers of all ages to discover the breath of Stephen Girard’s accomplishments. By using a question and answer line of narrative inquiry, the author gives us the details of Stephen Girard's life. He covers Girard’s family life as a boy in Bordeaux; his sailing from that city and eventually coming to the colonies as a merchant/mariner; settling in Philadelphia during the American Revolution; using his business acumen to become a worldwide trader; taking up farming; becoming a private bank owner, when the American banking industry was in its infancy; and using his extensive wealth to underwrite America's finances during the War of 1812. Beyond his own riches and successful investments, which are apparently well-known to American financial historians, Girard was a humanitarian and philanthropist leaving virtually his entire fortune to the City of Philadelphia. One of his lasting legacies is Girard College in Philadelphia which at its founding after Girard’s death in 1831 opened as a boarding school for fatherless boys. Girard College survives to this day. This book brings its founder renewed, well-deserved recognition. The author provides a surprising change of pace in developing several hallucinatory dialogues that Girard might have had on his deathbed with major figures of his time including, George Washington, Benjamin Franklin, and Thomas Jefferson. These dramatic exchanges gives us insight into what Girard might have wished to say been delighted to have heard regarding his acceptance as an American and his contributions to the country. A clever way to place Stephen Girard in an even larger historical context.